Tarzana Quest (cont): Later, we eagerly accepted an invitation to tour the "warehouse." This building on the adjacent lot had been built as a store but was later converted to a garage, and then to a storehouse for ERB Inc. product and ERB archival material. 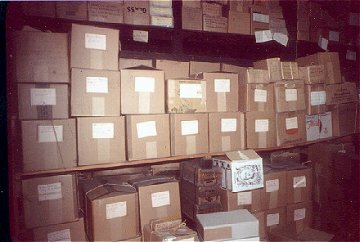 Labelled storage boxes were stacked floor to ceiling, and since there had been a fire (spontaneous combustion from old Tarzan nitrate film stock), many of the boxes were charred and in disarray -- cleanup was still in progress. 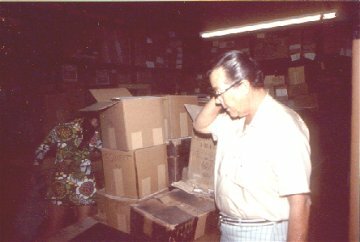 Enough of the labels were discernible, however, to give some idea of the treasures which lay within: A.C. McClurg & Co., Fan and Personal Letters, Motion Pictures, Real Estate, Tarzana, etc. 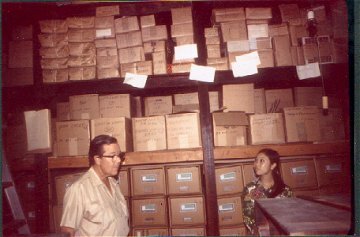 -- but the boxes that excited me most were the ones labeled Tarzan Radio Serials. One of the radio shows that had triggered an all consuming passion for programs from the Golden Days of Radio was Tarzan back in the early ‘50s. I had purchased a reel-to-reel tape recorder in 1963 and it wasn’t long before my nostalgia packrat instincts had amassed a collection of old radio shows on tape. Coincidentally, my first purchase was 77 episodes of the Tarzan serial from 1931. 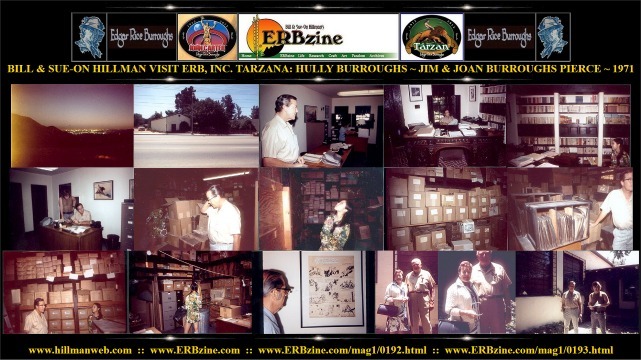 After reminding Hulbert that the stars of this series were James and Joan Burroughs Pierce, ERB’s son-in-law and daughter, I asked if I could look through the Tarzan Radio Serial crates. He mentioned that they had no way of playing the shows since they were on 16” electrical transcription discs, and that Mr. and Mrs. Pierce hadn’t heard the shows since they had recorded them many years before. At this point I told him that I had many of the shows on tape in my ERB collection (I even had a 16” Gates broadcast turntable set up to play ETs) -- and I would send copies of my tapes to them when I returned home. 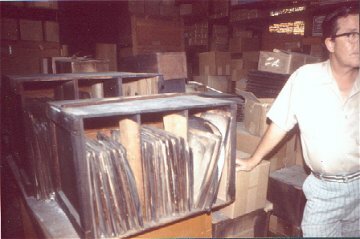 To my surprise, he seriously suggested that if I could find a way of staying in Tarzana I would have a job cataloging the discs and helping with the other inventory. One of my lifetime regrets was having to decline as both Sue-On and I had to return to Canada to finish University and to carry on with our performing and teaching careers. 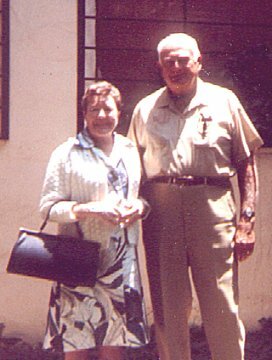 When it came time to leave, we were invited to return the next morning as James and Joan would be coming to the office for a meeting and he felt sure they would like to talk with us about ERB, movies, our collection, and the old Tarzan radio shows. As we were leaving, Hulbert autographed a Tarzana Chamber of Commerce/Bank booklet with a Crandall/Williamson cover and a short ERB bio & biblio inside. Next morning we returned with a carefully cleaned and polished Pentax, looking forward to meeting another of the Burroughs family and her “last-of-the-silent-movies Tarzan” husband. 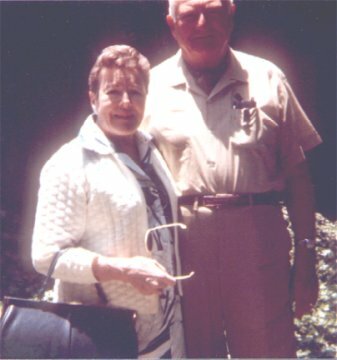 Jim and Joan proved to be just as gracious as brother Hulbert and we had a wonderful chat about the old days of Hollywood before we moved on to the work they did on the radio series. Both were extremely interested in my taped shows and I promised to send them copies as soon as I could. Our visit closed with Sue-On offering to take my picture with the Pierces (it didn't turn out - the gravel had done its work) -- under the large tree in the front yard, close to the spot where ERB’s ashes had been buried back in 1950. We returned to home to Manitoba and Brandon University -- and I kept my promise. 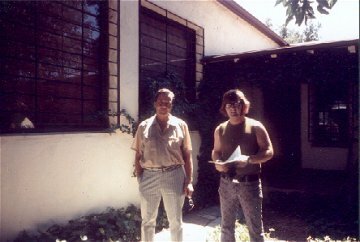 Some weeks later, a large box arrived from Tarzana, California. Carefully packed in the box were 13 ERB Inc. Tarzan books by Edgar Rice Burroughs - many of them first editions... and a stack of unfolded dustjackets from different editions! 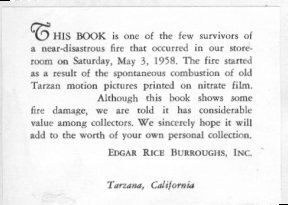 Each contained a sticker which read: THIS BOOK is one of the few survivors of a near-disastrous fire that occurred in our store-room on Saturday, May 3, 1958. The fire started as a result of the spontaneous combustion of old Tarzan motion pictures printed on nitrate film. Although this book shows some fire damage, we are told it has considerable value among collectors. We sincerely hope it will add to the worth of your own personal collection. we have finally been able to transfer from 35mm slides.